Rigging on a vessel consists of the mast and the booms, as well as the running and standing rigging. All of the blocks, tackles, rings and cleats that are attached directly to the mast are also included in the definition of rigging. The design and layout of rigging is determined by the type of vessel it’s on. Standing rigging ensures that the mast is secure on board and that it’s largely immobile. The individual wires which secure the mast are called stays and shrouds. The term stay is given to all ropes that hold the mast forward and behind and the term shroud is given to all of the wires that hold the mast to the sides. The wires are attached, trimmed and adjusted by the means of terminals and turnbuckles. Turn the mast, the Verstagung, all wire ropes and rolling plant with plenty of water to gently resting dirt, dust and salt residues to be removed from the previous year. Then wash the Verstagung and the mast profile with a sponge and a mild cleanser. Here you the extensive range SVB offers some solutions, such as the Schwammset Yachticon and Yachticon microfiber bristle glove. To clean the mast, we recommend a aluminum mast cleaner, also Yachticon. Refrain when cleaning the mast necessarily on a scouring pad, as this can damage the valuable anodizing of the mast. In order to polish the mast after cleaning we recommend the aluminum polish and wax Yachticon. This product not only provides a clean and radiant mast, it protected by its wax content, the aluminum surface of the mast. To let appear your mooring and other stainless steel, chrome and brass parts in a new light has the Yachticon metal proven in practical use polish. This can be easily remove stains, rust and light oxidation. The product also provides additional protection of materials. If you notice in the purification of the standing rigging damage to individual components of the rig, it is quite possible that you can easily replace these parts yourself. Here offers our SVB online store a wide range of fork terminals, eye terminal, shroud wires and Stagspannern, toggles and other parts of various sizes and fits for self-assembly. If you when cleaning the standing rigging broken strands, cracks in the wire or other weaknesses which to discover negative impact on the breaking load of the wires, these should also be replaced. Once you have your pole and all items thoroughly cleaned is at controlling the connections and screw bolts and nuts are tight and secure fit. If you notice during the inspection of the bolt that split pins have open spaces, the respective splint must be bent and removed and the nut to be tightened. After this is done the bolt and the nut must be secured with a new split pin. Please see them from a cotter pin to use more than once, because by the bending they are fragile and can no longer fulfill their function as a safety optimal! Glue from protecting the splints used with tape to your sail from being damaged by the pins. You can also follow your sails beautifully with our sailing schooners plastic from unsightly chafing / chafing by the cables of the rig. The sailing or also called Nockschoner can be easily adapted by drilling to the appropriate wire diameter. Damage of sails by turnbuckle can anticipate with special covers / protectors. The cable. Before you should ask the mast precaution all visible and accessible cable are controlled at the mast on their intact insulation and contacts are cleaned and treated with contact spray. If you discover the old fashioned rubber grommets on the cable penetrations, we recommend you to renew it. Navigation lights and lighting. To verify the functionality of your available on the mast lighting, you will be most effective in a simple 12 Volt battery. Link these with the wiring of the navigation lights and test if after the winter break still work flawlessly all lamps. Can you think of LEDs or bulbs on the light, you should not replace them. Here SVB offers a wide range of replacement bulbs . Mast accessories - antennas and Windinstumente. Last of all the dismantled in autumn antennas Windex and wind transmitter will now be checked to ensure their function and reassembled. His careful, however, because this accessory is very sensitive and can be damaged during transport. While in storage – to derig or not? When autumn draws near, each boat owner must decide whether or not they will store their vessel in its complete rigged state. Both ways have their pros and cons and there isn’t a way which is definitely better over the other. The decision to store a vessel in a derigged state must be taken according to the size of the yacht, its technical condition and your homeport/dockyard. We have added a few recommendations below as well as some tips and tricks for storing your vessel over the winter season. Why warehousing of the sailboat with standing mast? In many ports and winter camps is walk and add that ships with gestelltem, aufgeriggtem Mast spend the winter. Especially for owners of larger boats, in which the de-rigging and laying the mast a huge amount of work and a lot of documentation means and are in less wind and weatherproof fuller areas at home, is wintering with erected mast is a time-saving measure. They should, however, it eighth that of the Bock has a maximum bearing surface and the best possible fit of the goat is given to the fuselage contour around the hull of your yacht to relieve as much as possible and to spare. We also encourage you to place your ship in a sheltered place. In order to keep damage to the hull caused by vibration and the risk of tipping over as low as possible by high wind resistance of the mast, you should your mast equipment (flags, etc.) degrade, knock your sail, lift the spinnaker and boom and stowed on deck Remove as well as the running rigging. 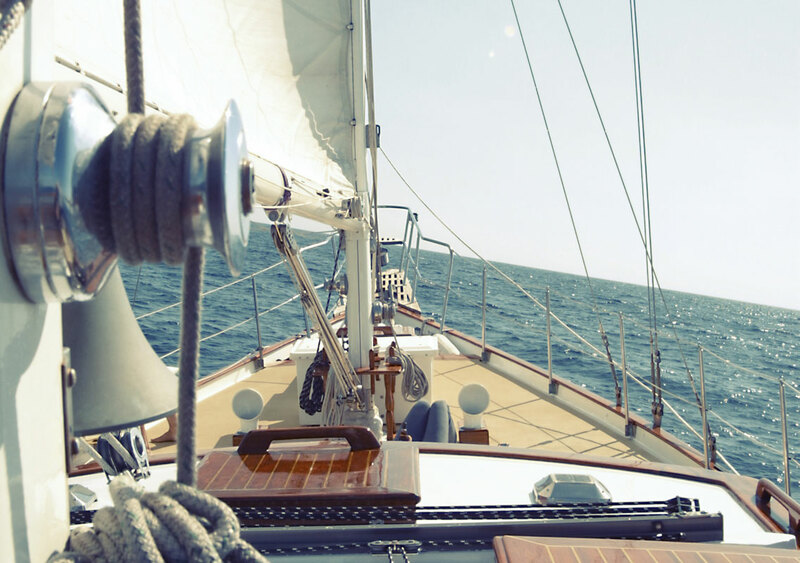 Before to let water in the spring, you should your mast and the rigging of an inspection to undergo to ensure that it has taken no harm in winter storage. An inspection on mast questions can best perform using a bosun's chair. Make sure that you check the Verstagung and their attachment points and all bolt connections for visible wear and damage. Also the fixed all screw has to be checked. Why choose the Insert and de-rigging of the mast? The weather and a few gusts of wind make a stationary rig in winter stock not much, because the ropes, Stage and rigging and the mast itself are indeed accurate for these loads designed. For the rig it is gentler to spend the winter at the established mast, for every up and de-rigging, each clamping and releasing is an additional stress on the standing rigging is. But is different with the hull of the yacht. If the vessel is taken in the winter storage of a so-called bracket / boat frame, the body is supported at only four smaller points of support, what the material, especially in a sandwich construction of the hull, heavily burdened. Especially for vessels overwinter outdoors, a capped mast for danger can be, because by wind gusts can lead to unwanted oscillations or vibrations of the mast, which load the material and even have the overthrow of the yacht of your bracket for consequences in the worst case can. The maintenance and control of the standing rigging is one of the most important tasks of each sailboat owner and can be sustainable only in abgeriggten state. The test rig should not be confined to a brief assessment on immediately visible damage because shrouds and shrouds are among the most highly stressed components of a sailboat. material failure can lead to nasty surprises then that if in bad weather and heavy seas suddenly the rig breaks especially in an unprepared crew on the high seas. Many sailors underestimate the enormous weight of the rig, the sails and the course overturned mast, it breaks easily panic on board and the distress situation begins. To give such a disaster does not first have a chance recommend SVB specialists for regular maintenance and renewal of your rigs. What should I consider when mast Place and de-rigging? To retrieve the original basic trim of the rig in the spring quickly and then only having to make fine adjustments, we recommend before laying the mast marks both the mast foot to make the turnbuckle and on the threads of the turnbuckle. This is very easy with tape or repair tape. After you have documented the basic trim of the rig, the cranes can begin. Loosen the Verstagung of Riggs and making sure the turnbuckle stagseitig solve. To prevent damage to the tensioner by unnecessary drag on the ground during the Kranens. Warning: cotter pins should never USER twice! SVB offers affordable Niro cotter pins and pin-quality stainless steel. This should in any rigging renew the quality of the entire Riggs needs. The winter break is the perfect time to order all halyards and sheets catching for chafing and to purify it. Before you pull the running rigging by means of a pilot line / lifeline from the mast, we recommend you some quick photos for documentation to shoot. The mast, all the wires, shrouds and stays should be checked for visible damage such as cracks and fractures and freed with lots of fresh water from the salt. In fattening aluminum we recommend an aluminum mast cleaner to remove traces of salt and dirt. Here is also the mild foam cleanser The thread tensioner can with a brass / or stainless steel brush cleaned with special grease be re-greased. The standing objects should be washed before storage with clean fresh water and then dried well. Finally, the accessories at the top of the mast located, so the masthead tricolor, the wind sensor, the pennant and the antenna is reduced by these sensitive parts heal to them through the winter. To protect your electrical system during the wintertime from wetness we recommend the Allrounder "Wet Protect" of TALAMEX. You should also inspect the pulleys in the top of your glider and make any lubricant again consistently. Our top lanterns are normally supplied with a lid. not Throw this away, because it is ideally suited to protect the masthead light during storage! I discovered damage to the rig - what should I do now? For the control of the wires, shrouds and stays the rig need not be necessarily dismantled in winter storage. The situation is different here, but if you notice during maintenance, for example, torn terminals, kinks in the wire chafing or notches. Then, the affected area should definitely be replaced and renewed since the original breaking load is now no longer guaranteed. Our SVB wire rope and rigging team will help you in making spare wires or the complete replacement of the standing rigging of your yacht. You can send us your old wires like and we will construct on the basis of supplied specifications then your new rig. Look here, however, make sure that the supplied clamps are under tension to the correct length of the wires being able to determine. On the basis of the sent wires, we can then determine whether we might still be able to optimize the new wires: The wire gauge change or change the material. We recommend when replacing the wires always the shroud wires and Stagspanner and rings, lockers and bolt connections renew. Never replace only one wire, but also always its counterpart to the trim of the rig by the new rigging wire to prevent negative influence. Expiration date Rigg: When should I renew my rig? The age of the shrouds and stays plays an important role when considering a complete replacement of the rig. Almost all renowned insurance companies now require the replacement of the standing rigging to a maximum of 15 years or 20,000 miles covered, if not earlier. Of course, the state of the rig is also related to the degree of stress. Please inform yourself here in an individual case with your insurance company. The specifications mentioned are based on many years of experience and must be adhered to for the safety of the crew on board to ensure. Although everything looks intact from the outside, the material fatigue is used regularly over the years and there is an embrittlement of the stainless steel, and the stretched wires. This can lead, in extreme cases and at the lack of preparedness for Mastbruch at sea. This checklist helps you systematically review your rigging, so that nothing is forgotten.